October is National Pasta Month and I am celebrating with Cucina Antica and you can make delicious, authentic Italian recipes or even try new recipes made with artisan ingredients. 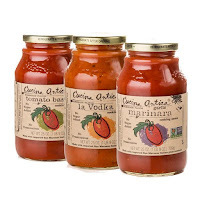 Cucina Antica makes cooking sauces that are better for you option and full of authentic flavor. They are made with imported Italian San Marzano tomatoes, no artificial preservatives, lower sodium, no added sugar, no added water, and no tomato paste. Cucina Antica provides at-home chefs products made through an artisanal production method that allows consumers to cook the sauces without losing any flavor. They are one of few sauces that are non-GMO verified. What is your favorite pasta dish? I enjoy making lasagna, Italian bake which includes any type of noodles, Hamburg, put in a casserole dish and topped with cheese I don’t know the correct name for it but I and that’s a good dish. Chicken Parmesan the sauces a good for about any recipe you enjoy making or creating a new dish.